Coached an U14 side at Brisbane Boys College, AUS. Started my own football academy in Brisbane, AUS. 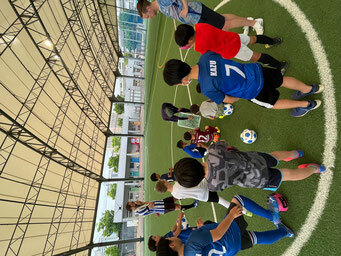 Started my own football academy in Vancouver, Canada. Coached students at JEC(Japanese language school) in Vancouver, Canada. Coached at the official FC Barcelona football academy called FCBESCOLA, Vancouver, Canada. 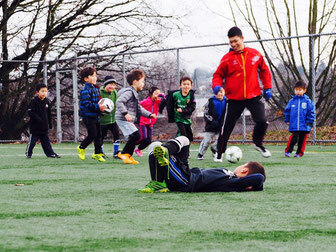 Coached U7 to U10's kids at Wesburn SC, Burnaby, Canada. Started my own football academy in Dublin, Ireland. Coached a U9 side at Terenure Rangers FC, Ireland. Coached the North Dublin Schoolboys League select (U15). Coached U7 kids at Cherry Orchard FC, Ireland. Coached a U9 and U8 side at Lourdes Celtic FC, Ireland. Back in my school days, I was torn among few options for my future. I wanted to make the cut in J-league(Japanese professional soccer league), but I wasn't simply good enough to be scouted by any of clubs in the league. So I made up my mind going to an Uni and learn English with an ambition to go overseas after graduation. In the meantime, I had desperately saved up comfortable cash reserves for it by doing some part-time jobs. In 2008, I took off to Australia for the first time with amounting to about 20.000 USD that I managed to save up while in Uni. 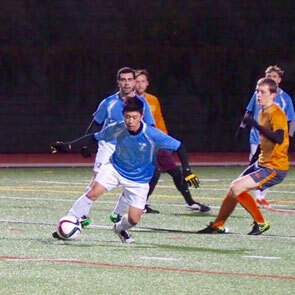 After much trial and error, I had been hanging on there for two years and half and got to play at a semi-professional level in Brisbane, Australia in the end. And in the end of 2010, I determined a new journey in New Zealand and got to make a contract with Young Heart Manuwatu in the national league in the country after a few weeks trial. As soon as the first season ended, I transferred to Bay Olympic in the winter league in Auckland football federation. In the meantime, I started off my first ever soccer academy called Brissy football academy in Auckland for mainly Japanese kids who born in NZ. Luckily, it ran with a huge success that ended up doing with 30 to 40 kids every weekend. Moreover, I got to kick off a soccer lesson as a part of after-school activities at a local school called Edendale primary school and made it a successful event during the period with more than 50 kids at every session. On Christmas in 2011, I was on board an aircraft to India for a trial. And I got to make a pro-contract for the season. Then, I went back to Australia to keep myself fit for the next journey in Fiji. After the few days trial, I got an opportunity to take part in one of the biggest Cup tournament in Fiji for a month. In 2015, I moved to Vancouver, Canada and put more importance on coaching in soccer rather than as a player. At the same time, I established myself in my coaching career by setting up my own soccer academy called 'Brissy Football Academy in Vancouver'. In the meantime, I also started working for the first official Barcelona academy in Canada called FCBEscola Vancouver by taking advantage of the career in my previous jobs. As a result, I was able to meet my goals that wanted to get results in coaching in an English speaking environment as that is what I would like to do in Japan. In early 2017, I moved to Dublin, Ireland for acquiring coaching licences in UEFA and coaching experiences in Europe. As soon as I got things settled, I signed with Dublin Bus FC (Third tier of Irish football) and also started coaching for an U9 side of Terenure Rangers FC, and at the same time, set up my own academy 'Brissy Football Academy in Dublin'. At that time, I had an incredible encounter with Tony Sherridan, a former U21 Irish international and Premier leaguer at Coventry back in early 90's. I also got to pile up experiences at Cherry orchard and the select team in North Dublin schoolboys league as a coach. And I moved to Lourdes Celtic FC to coach the U9 and U8 sides as Tony left to Celtic as well to finish off the coaching journey in Ireland. At the moment, I've been in the process of getting the National C license in Ireland that is equivalent with UEFA C license. I also encourage youngsters to go overseas by giving them advice and tips through my past experiences. You can check out more details on the "services" page in the HP.